6/1 Cup of Coffee: Portland swept both games of a doubleheader and the DSL won in convincing fashion. The rest of the system was not so lucky, combing to score only three runs between them. Greenville and Salem were blown out, while Pawtucket dropped a close one. The Pawtucket Red Sox fell to the Norfolk Tides (BAL), 3-1. The rehabbing Steven Wright took the loss for Pawtucket, tossing six innings of three-run ball. Wright gave up seven hits and walked one batter while striking out six in his first appearance of the year as he works his way back from a sports hernia repair. John Ely finished off the game, allowing three hits in the final two innings. The Portland Sea Dogs beat the Trenton Thunder (NYY), 9-4, in game one of a doubleheader. The game, a make-up of an April 7 contest, was started and finished by Keith Couch who went all seven innings to notch his seventh win of the season. Couch allowed four runs (two earned) on seven hits while striking out five and walking no one. Couch needed 88 pitches to get through seven innings, throwing 57 of them for strikes (roughly 65 percent). The Sea Dogs' offense jumped all over Thunder pitching, scoring once in the first, five times in the fourth, once in the sixth, and finally twice in the seventh. The Sea Dogs went down in order in only the third inning, managing to get a man aboard in every other frame. Mookie Betts (pictured, above) went 3 for 4, with his third triple of the year, three runs scored and four RBI. The Thunder could seemingly not retire Bo Greenwell who had two hits, walked once, and reached on a throwing error after executing a sacrifice bunt. Of Portland's starting nine, only Blake Swihart and Stefan Welch were held hitless, though Swihart did walk once. Portland also took game two, beating Trenton, 4-3. Mike McCarthy pitched well enough to pick up his fourth win, though a bad inning nearly derailed his victory. McCarthy went six innings, allowing three runs, all of which came in his final frame, on six hits. Noe Ramirez closed out the final inning of the game on 11 pitches to earn his sixth save of the season. Mookie Betts picked right up where he left off, delivering another 3-for-4 performance, this time hitting a double and scoring two runs. Deven Marrero joined in, going 2 for 4 with a double, three RBI and a run scored. Marrero won it for Portland though, singling in the seventh to drive in Betts and Bo Greenwell to turn a 3-2 deficit into a 4-3 advantage. Most of the Sea Dogs' offense came from the top of the order with the first and second hitters collecting five of the team's eight hits and the third and fourth batters also notching one apiece. Tim Roberson scored Salem's only run on a fielding error after hitting his sixth double of the season. Leonel Escobar and Reed Gragnani collected two hits apiece for the Red Sox. Roberson, Kevin Heller and Mario Martinez each added a hit of their own. The Greenville Drive, despite out-hitting their opposition, were blown out by the Hickory Crawdads (TEX), 7-1. Teddy Stankiewicz took the loss even though he did not give up an earned run. Stankiewicz surrendered three runs on four hits and two walks while striking out three. Neither Ellis Jimenez nor Taylor Grover were able to record a strikeout as they combined to allow four runs on four hits and four walks in their three innings of work. The Drive managed to collect 11 hits, but it only amounted to one run. Only Tzu-Wei Lin and Jordan Weems were kept out of the hit column and three players collected multiple hits. Jantzen Witte continued his hot month with a 3-for-4 performance with a run scored. Forrestt Allday went 2 for 4 with two doubles and a walk, while Manuel Margot also went 2 for 4 with one double and an RBI. The DSL Red Sox kicked their season off with a bang, pummelling the DSL Mets 1 (NYM), 10-1. Daniel Gonzalez picked up the win for the Red Sox, throwing five innings of one-run ball, allowing six hits and one walk while striking out four. Juan Perez and Jervis Torrealba combined to shut the Mets out over the final four innings. 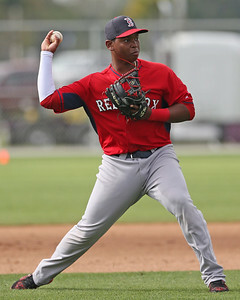 Rafael Devers (pictured, right) paced the offense, going 3 for 5, with his first professional double and home run as well as two runs scored and four RBI. Carlos Tovar, Roldani Baldwin, and Samuel Miranda all had two hits apiece. Player of the Night: Mookie Betts scoops up these honors yet again with outstanding play across both halves of a doubleheader. Betts' 6 for 8 performance across two games was impressive. 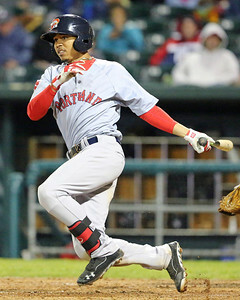 Betts now owns a .362/.449/.562 line, which places him in the top-five in all three statistics in the Eastern League. Similarly Bett's 1.009 OPS is good for third in the Eastern League as he continues to feast on Double-A pitching. Betts manned center field in both games for the Sea Dogs.